I called my parents to go to lunch, and my father said “There’s a place in Concord that is supposed to have very good Dolsot Bibimbap…” We have become big fans of Korean food, it is similar to Japanese cuisine in many ways, but fiery with a heavy emphasis on meat, and I crave the spicy tofu soup during the cooler winter months. 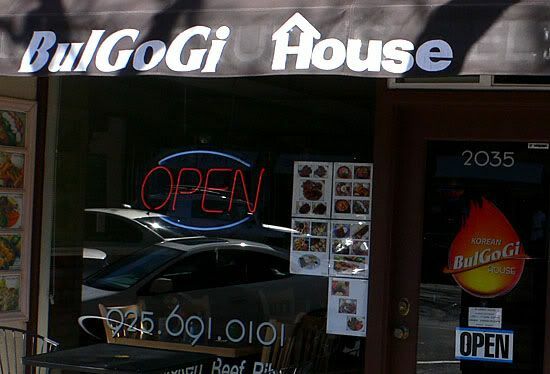 Korean Bulgogi House has the distinction of not being in an anonymous strip mall in Concord. It is on Salvio Road along a row of stores and restaurants with a nearby parking garage. 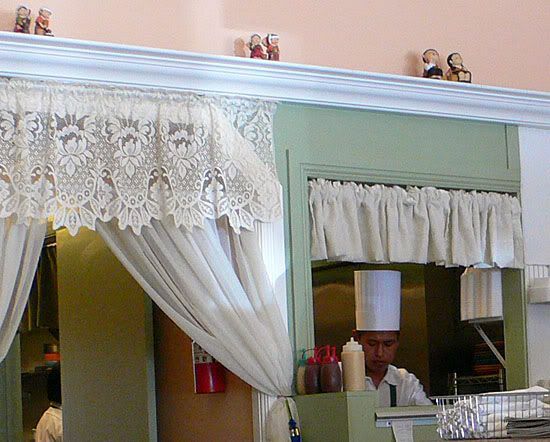 The interior of the restaurant has pastel walls with crown molding displaying an assortment of korean dolls, notice the chef wearing the toque through the window… It’s brightly lit from the big windows in front and each table has a twinkling tealight nestled in a squat green glass holder. It has a nice upscale ambiance and is much nicer than most Korean restaurants. The signature bulgogi, which translates to fire meat, or grilled meat. We had chicken bulgogi which was juicy and flavorful, my Dad couldn’t stop eating it and kept raving about the spicy sauce. We also ordered a seafood tofu soup, medium spicy, which had a decent kick. The soup was full of soft tofu, prawns and scallops, very bright and clean tasting. 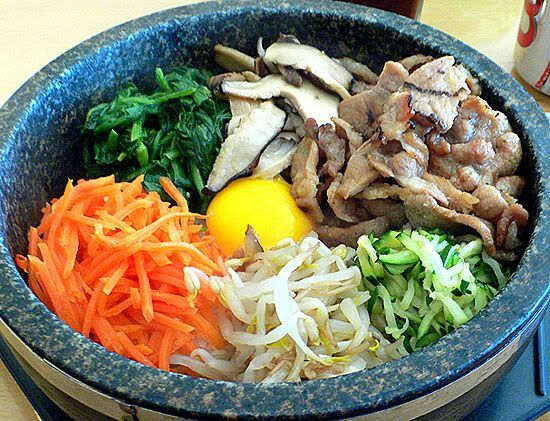 The glorious Dolsot Bibimbap arrived, a gorgeous arrangement of spinach, meticulously chopped carrots, zucchini, shiitake, thinly sliced pork, bean sprouts and a quivering egg in the center. 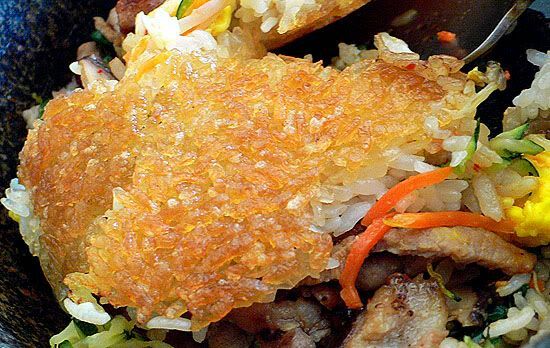 You could hear the rice sizzling and crackling against the super hot stone bowl. This is my new favorite korean restaurant! Oddly, they did not serve panchan, the myriad little dishes of kimchee, pickled veggies, fishcakes, seaweeds, noodles, and eggcakes that normally accompany Korean meal… But when we asked for plates to share, they each came with a big scoop of rice, a small salad, some cucumber kimchee pickles and a few pieces of sweet, crispy fried potatos that normally are part of the panchan course, so along with the kimchee earlier, we really didn’t miss it… and were probably able to eat more of the main courses! I wonder if they may call themselves a true and only Korean restaurant. 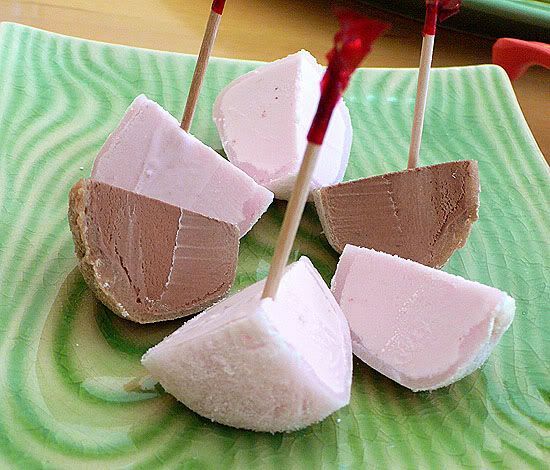 I recon their Korean dishes must be savoury, but edamame, tofu soup and mochi ice cream are Japanese! Well, we are into globalisation, aren’t we? 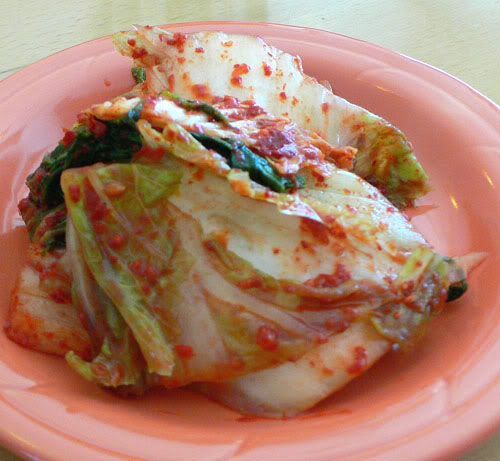 Kimchee is eaten in Japanese homes. My Japanese wife is just crazy about it! I totally agree on your review of B.House in Concord…but their lack of panchan definitely deters me from going back there. For me? It’s all about the panchan…it reminds me of dinner at Mom’s, yanno? Have you tried the Korea House down the street in the Park N Shop mall? Decent food, great panchan. Although you have to get over the owner lady’s half-styled hair. It’s like a car wreck, you can’t divert your gaze. ps: Tofu soup isn’t just a Japanes dish, Robert-Gilles. Miso is Japanese, however the soup that FoodHoe had at B House was 100% Korean. 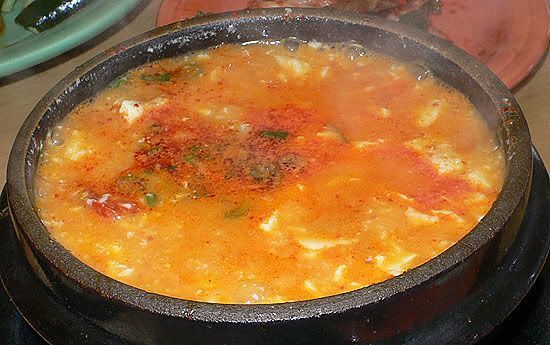 It is called Soon Dubu Chigae. i have to disagree i tried their chicken bulgokee which my little brother ordered and i ordered the dolsot bibimbap which was alright but the chicken bulgokee had a weird taste not the traditional korean bulgokee they used some weird sauce i think they tried to suit the american people. I the korea house in park n shop is way better. and also did anyone who went to korea house notice the owner lady (crazy hair) always says “see u tomorrow” when ur about to leave i thought that was funny i went there a few times and every time we leave shes says that line. I would have to disagree with this entire review not the other comments. I went there the other night with my family (11/2007) and it was not at all authentic Korean Food. 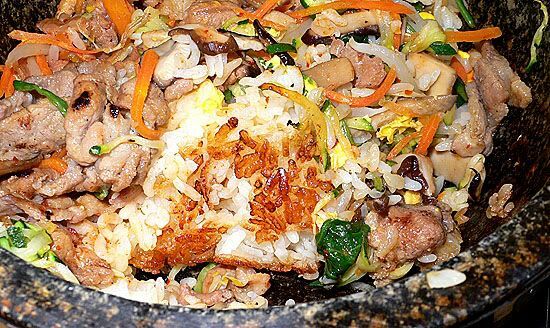 Being a Korean male, I have had the pleasure/or was blessed with having a Korean Mother who made great Korean Food, and also taken to really good Korean Resturants. It was a nice and clean place. But the food and an American Korean attempt. It almost seemed as if they owners were trying to fit into the “DOWNTOWN” Concord,….or wanna be Broadway Plaza style food. 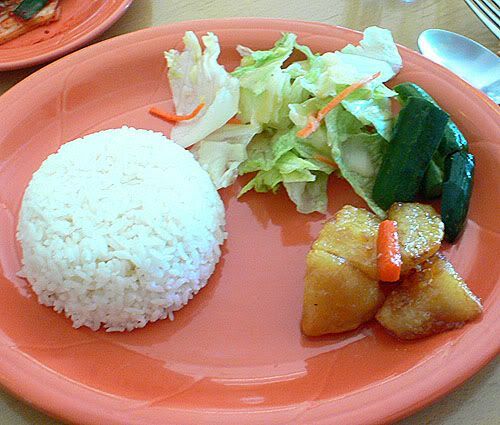 The DOL SOT was not as hot, bland and the rice was not sticky style rice. The Bulgogi was ok even though my kids loved it. My wife is all American and she fell in love with Bibimbap now even more with the HOT DOL SOT, and she even commented that this place wasn’t like other Korean style Korean resturants. ME TOO with the little appetizers. THAT is classic Korean….I am going to try the Korea House down the street in the Park and SHOP tonight (11/13/07). My neighbors who are both 100% Korean recommended the place. also I have heard that the Korea House serves many Korean Families….I know that most of you have heard that if there are alot of Hispanic people in a mexican resturant, or Chinese People in a Chinese resturant…you’ve come the right place. Well when it comes to the crazy lady. It’s the traditional Korean woman. She’s trying to be a good hostess and also make people feel at home. It’s the respect that you get coming into her place of business. Don’t get freaked out about it. Korean People especially when they cook, aim to please. And sharing ideas, styles and trying different foods is how’s she trying to express her heritage, happiness for you coming to her place, and most importantly expressing her Korean PRIDE. Hope it turns out ok. I will Post a review after I eat there tonight. DOL SOT and TOFU SOUP (KimChee/Pork style) HERE I COME!!!!! Wow!, I love it that you took the time to write such a lengthy rebuttal! I am no authority on Korean food and haven’t been back to the Bulgogi House although in my defense, you can’t find fault with the service and the fact that it is so clean and tidy. I’d agree that it is very Americanized and that it’s just not right that they don’t serve panchan (but I did like the mochi ice cream)… Hope you found what you were looking for at Korea House. 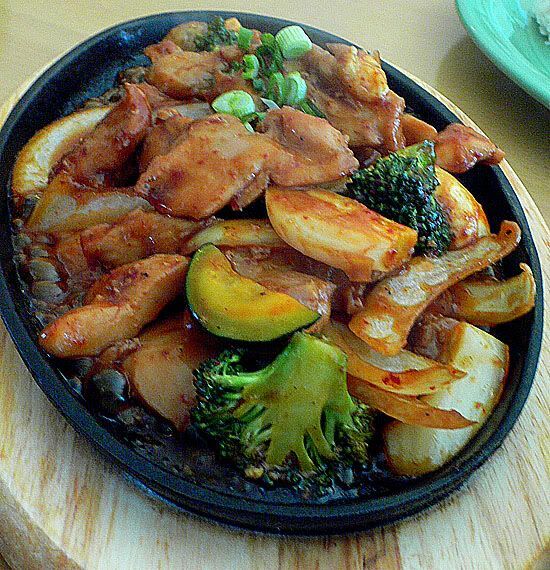 FOODHOE- KOREA HOUSE ROCKS!….went there..only down the street from Korean Bulgogi House and miles different. If you haven’t tried it…go give it a twirl. It’s awesome!